Late nights and early mornings are sure to keep your New Dad on the run. 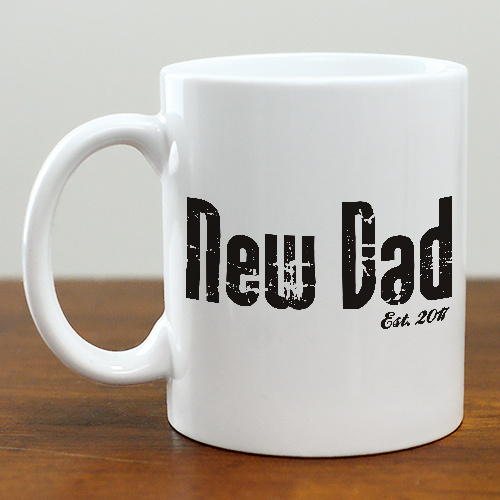 Re-energize your New Dad with hot coffee served in his Personalized New Dad Coffee Mug. A great Personalized Father's Day Gift your New Dad will love & cherish. Our Custom Printed Proud New Daddy Coffee Mug is available on our Dishwasher safe Ceramic Coffee Mug and holds 11oz. Includes FREE Personalization! Personalize your New Daddy Coffee Mug with any title and choose between Pink, Blue, Brown or Black colors. Great gift for my grandson. He is so happy to be having a new baby. No size or color problems with this gift. Coffee mug was a little smaller than anticipated, but otherwise exactly as described & expected. Check out our entire collection of Personalized Father's Day Keepsakes. Our Personalized Father's Day Poem Keepsakes are great for gifts for Dad. Create an Engraved Keepsake Photo Frame for Dad, Grandpa, Brother or Uncle today.